Coffee With Games: 2011's Video Game Turkey Award! What do Bobby Kotick and Michael Pachter have in common? They received CoffeeWithGames' Video Game Turkey Award in 2009 and 2010, respectively. The Video Game Turkey Award goes to either a video game company, and/or a person within the video game industry that through actions or words caused uproars in the video game community during the last year; and in return the company/person was roasted/baked/fried like a good turkey by the video game community. A lot has happened in the video game world in 2011, but did Bobby Kotick or Michael Pachter receive the Video Game Turkey Award again? Take a look and see which video game company/person receives the 2011 Video Game Turkey Award! Nintendo released the new 3DS system and drastically dropped its price within months. The 3DS price dropped from $249.99, down to $169.99 in North America, and though Nintendo did the 3DS Ambassador program to alleviate people's anger/concern, many people felt burned by the price drop. Nintendo released the 3DS without all its features fully functional: no web browser, no 3DS eShop, no effective communication with friends, etc. Why would a company release a system without having all its features fully functioning? I still have no idea. Nintendo failed to see the usefulness of a second circle pad with the initial 3DS' design, and then it was leaked within months of the system's release that a separate 3DS Circle Pad attachment would be coming out for the system, sold separately of course. This rumor/leak made many people wonder if an imminent 3DS redesign would be announced, something that I think will happen in early 2012. Reggie's apparent failure to lead Nintendo of America by having very few first-party Nintendo titles for the Wii in 2011, lead to the Operation Rainfall effort. For me, this is why Reggie gets the 2011 Video Game Turkey Award. I know many Nintendo fans like Reggie, but I think he failed Wii owners and Nintendo fans in 2011 by not bringing either Xenoblade Chronicles, The Last Story, or Pandoras Tower to the States; just one of those titles would have been nice. This wasn't the first time Reggie and Nintendo of America failed to bring fully developed Wii game to the States though, as Disaster: Day of Crisis still has not been released for us, but it has been out for a few years now in Japan and Europe. The failure of Reggie Fils-Aime and Nintendo to support the North American Wii in 2011, with games that were already developed, makes me wonder what/if any pull Reggie actually has in decision making. While I have many more areas I could mention(Wii U), for me the 3DS' rough start, and Reggie's and/or Nintendo's failure in bringing fully developed games to the Wii in North America, caused them to get baked/fried/roasted in 2011, and I believe most of it was absolutely deserved. If you are interested in trying to get Reggie and Nintendo of America to bring Xenoblade Chronicles, The Last Story, and/or Pandora's Tower to North America, you can learn more about the ongoing effort at OpRainfall.Blogspot.com. I personally think that North American Wii owners will probably get Xenoblade Chronicles, The Last Story, and perhaps Pandora's Tower in 2012, but then again I have been looking for Disaster: Day of Crisis for a while now. 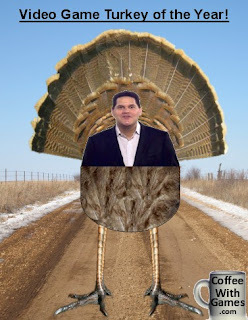 Do you agree with my 2011 Video Game Turkey Award? If not, what company/person would you give the award? Also, do you think, like I do, that the main three Operation Rainfall games are likely to see a North American release in 2012? Apologies for the late reply, Coffee! Yes, I've played all three of them. Xenoblade in English, and the other two in Japanese on import (when I assumed they wouldn't get western translations). My Japanese isn't great, but it's workable, and I didn't enjoy Pandora in the slightest. Last Story is the best Wii RPG I've played, though - I do understand the disappointment in America over not getting that one. What I didn't like about Pandora's Tower is pretty simple - it tried very hard to be a gritty action game, in the vein of God of War or even Castlevania on the PS3, and it just doesn't do it that well. Given there's no real competition for that genre on the Wii, the interest is fair enough, but as with Xenoblade, I don't personally feel these games hold much value to people who have a PS3 as well. But yeah, down with Reggie! Haha! Yea, I made the switch last night, but I have all the comments saved, and I'm manually entering them as they were, with a little rearranging. So, the comments disappeared, but should be returning with proper name credit. Whoh, anyone see NoA's twitter feed? Looks like Xenoblade may hit the US after all. There's also a rumor on Dtoid about it as well with an exclusive release at GameStop. Still a turkey or maybe a turducken? Still a Turkey...this is for 2011! I even said in the "question" section that I think some of the games would see release in 2012, but it came down to how the community reacted to this in 2011, and how Nintendo did/didn't react as well. But yea, saw the reports on Xenoblade's 2012 release, and it does look like GameStop and Nintendo will be the exclusive sellers of the game. Thanks for checking back on it! To be fair, the only game you guys really missed out on was The Last Story. Xenoblade is not really a great game - anyone who has a PS3 or Xbox 360 has access to better RPGs, and Pandora is downright terrible. For Nintendo's general mismanagement of the 3DS and its online, I agree with your general sentiment, though. "Xenoblade is not really a great game - anyone who has a PS3 or Xbox 360 has access to better RPGs, and Pandora is downright terrible"
"For Nintendo's general mismanagement of the 3DS and its online, I agree with your general sentiment, though"
So wait, you don't like Xenoblade that much either? What about Pandora's Tower? Nope, I was trying to say that I disagreed. Xenoblade is a great game, having played it and both The Last Story and Pandora's Tower look like very good games! Ah, okay! Thanks for clarifying it. See, I'm leaning more with superphillip on this one, only because the overall player and reviewer reviews are positive for Xenoblade, and even Pandora's Tower has positive USER feedback. Again, it's not that some people may have a PS3 and Xbox 360, it's the fact that Nintendo of America is not supporting their own console with their very own games. And again, it's not just that I only feel they should have released those games, but a larger community in general did with the situation, which is why Operation Rainfall came about. BTW, were you able to play all three of them? "Xenoblade is not really a great game - anyone who has a PS3 or Xbox 360 has access to better RPGs,"
The majority of players and reviewers would greatly disagree with you. Yea, I have been surprised at some of the player reviews for the games, and the one I'm most interested is Pandora's Tower and it seems to have been received decently well by players. Not sure on the operation rainfall situation, though the various things with the 3DS, fading Wii lineup despite bit talk along with touting the Wii U without many details has soured me a bit. Having no access to the ambassador games (for purchase) or a target date is also annoying. Then again Zelda four Swords for free is pretty darn good. 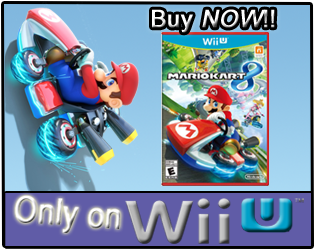 "fading Wii lineup despite bit talk along with touting the Wii U without many details has soured me a bit." I never even posted my Wii U thoughts post after E3...just because it is a big bucket of negative. Thanks everybody for the comments/feedback so far! If any of you have played the Operation Rainfall games, particularly Pandora's Tower, what did/didn't you like about them? I won't argue too much with this, for many of the same reasons you listed. My runner-up turkey? That would probably be all these online 'codes' needed to access extra features or online play for games. I don't like the practice because I'm a big fan of used games, but more than that, I dislike it because members of the same house using the same console often need multiple codes, so instead of just making a $60 purchase for a new game, you sometimes have to drop $70-90 so everyone can enjoy the same features. Bad, bad trend imo. Turkey award is one of the most best award for video games. I wish all video games which get this award. I need the list of video games which gets turkey award 2011. Not sure on the operation rainfall situation, though the various things with the 3DS, fading Wii lineup despite big talk along with touting the Wii U without many details has soured me a bit. See, I'm leaning more with superphillip on this one, only because the overall player and reviewer reviews are positive for Xenoblade, and even Pandora's Tower has very positive USER feedback. Again, it's not that some people may have a PS3 and Xbox 360, it's the fact Nintendo of America is not supporting their own console with their very own games. 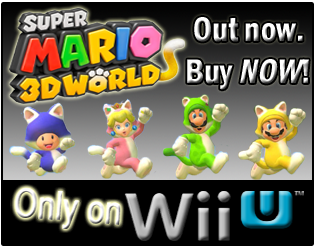 "...fading Wii lineup despite bit talk along with touting the Wii U without many details has soured me a bit."